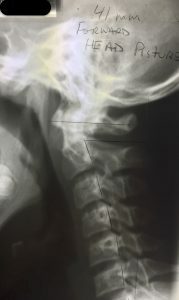 Oscar’s x-ray analysis helps explained how Chiropractic was successful in his recovery and preventing future re-injuries as he continues to play soccer. Oscar has played soccer since 4 years old and is how 17. He plays his high school team and a club team. If you have watched boys soccer after the age of 10-12, it becomes very physical. This can lead to injuries needing surgery. Soccer is the #2 number of concussions per year. Oscar tells his story in this post/video. In comparison, Oscar x-ray is straight instead of normally curved. 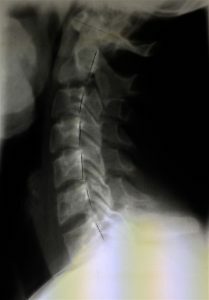 The straightening can stop normal spinal motion that will cause the spinal discs between the bones to thin. Normal spinal motion keeps the pressure off the nerves, and allows the neck to feel healthy. 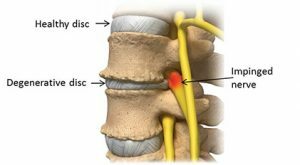 No motion can lead to degeneration of the disc and pinching of the nerves as in Oscar’s case. 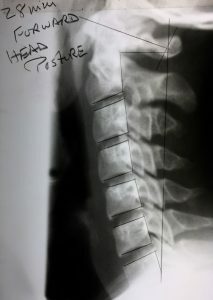 Now the spine is start having a normal curve, by having the Forward Head Posture reduce from 41mm to 28mm. This allows normal motion of the neck allowing reduced nerve pain and less chance of re-injury. Sport injuries can feel better quickly. When injuries continue to reoccur or do not leave, getting an x-ray analysis like Oscar can allow full recovery through proper treatment. Then your spine and health can get to 100% again.